A cycle of communication and two-way communication are actually two different things. If we examine closely the anatomy of communication—the actual structure and parts—we will discover that a cycle of communication is not a two-way communication in its entirety. Here we have Joe as the originator of a communication. It is his primary impulse. This impulse is addressed to Bill. We find Bill receiving it. And then Bill originating an answer or acknowledgment, as Bill´, which acknowledgment is sent back to Joe´. Joe has said, for instance, “How are you?” Bill has received this. And then Bill (becoming secondary Cause) has replied to it as Bill´, with “I’m okay,” which goes back to Joe´ and thus ends the cycle. Here we have Bill originating a communication. Bill says, “How’s tricks?” Joe receives this. And then as Joe´ (or secondary Cause) answers, “Okay, I guess,” which answer is then acknowledged in its receipt by Bill´. In both of these Graphs, we discover that the acknowledgment of the secondary Cause was expressed, (in Graph A) by Joe´ as a nod or a look of satisfaction and, again, (in Graph B) Joe´’s “Okay, I guess” is actually acknowledged by Bill´ with a nod or some expression signifying the receipt of the communication. Here we have Joe causing a communication and Bill´ failing to continue the cycle. We do not know or inquire and we are not interested in whether or not Bill, as the receipt-point, ever did hear it. We can assume that he was at least present and that Joe spoke loudly enough to be heard and that Bill’s Attention was somewhere in Joe’s vicinity. Now, instead of getting on with the cycle of communication, Joe is left there with an incompleted cycle and never gets an opportunity to become Joe´. Joe failing to emanate a communication. Bill failing to hear the communication. Bill´ failing to reply to the communication received by him. Joe´ failing to acknowledge, by some sign or word, that he has heard Bill´. We could assign various “reasons” to all this. But our purpose here is not to assign reasons why they do not complete a communication cycle. Our entire purpose is involved with the non-completion of this communication cycle. Now, as in Graph A, let us say we have, in Joe, a person who is compulsively and continually originating communications, whether he has anybody’s Attention or not and whether or not these communications are germane (pertinent) to any existing situation. We discover that Joe is apt to be met, in his communicating, with an inattentive Bill who does not hear him. And thus, an absent Bill´ who does not answer him. And thus, an absent Joe´ who never acknowledges. Let us examine this same situation in Graph B. Here we have, in Bill, an origination of a communication. We have the same Joe with a compulsive outflow. Bill says, “How are you?” and the cycle is not completed because Joe, so intent upon his own compulsive line, does not become Joe´ and never gives Bill a chance to become Bill´ and acknowledge. Now let’s take another situation. We find Joe originating communications and Bill a person who never originates communications. Joe is not necessarily compulsive or obsessive in originating communications. But Bill is inhibited in originating communications. We find that Joe and Bill, working together, then get into this kind of an activity: Joe originates communication, Bill hears it, becomes Bill´, replies to it and permits Joe a chance to become Joe´. This goes on quite well, but will sooner or later hit a jam on a two-way cycle which is violated because Bill never originates communication. A two-way cycle of communication would work as follows: Joe, having originated a communication and having completed it, may then wait for Bill to originate a communication to Joe, thus completing the remainder of the two-way cycle of communication. Bill does originate a communication, this is heard by Joe, answered by Joe´ and acknowledged by Bill´. Thus we get the normal cycle of a communication between two “terminals.” For in this case, Joe is a terminal and Bill is a terminal and communication can be seen to flow between two terminals. The cycles depend on Joe originating communication, Bill hearing the communication, Bill becoming Bill´ and answering the communication, Joe´ acknowledging the communication. Then, Bill originating a communication, Joe hearing the communication, Joe´ answering the communication and Bill´ acknowledging the communication. If they did this, regardless of what they were talking about, they would never become in an argument and would eventually reach an agreement—even if they were hostile to one another. Their difficulties and problems would be cleared up and they would be, in relationship to each other, in good shape. A two-way communication cycle breaks down when either terminal fails, in its turn, to originate communications. We discover that the entire society has vast difficulties along this line. They are so used to “canned” entertainment and so inhibited in originating communications (by parents who couldn’t communicate and by education and other causes) that people get very low on communication origin. Communication origin is necessary to start a communication in the first place. Thus we find people talking mainly about things which are forced upon them by exterior causes. They see an accident, they discuss it. They see a movie, they discuss it. They wait for an exterior source to give them the occasion for a conversation. But in view of the fact that both are low on the origin of communication—which could also be stated as “low on imagination”—we discover that such people, dependent on exterior primal impulses, are more or less compulsive or inhibitive in communication and thus the conversation veers rapidly and markedly and may wind up with some remarkable animosities (hostile feelings) or misconclusions. Let us suppose that lack of prime or original Cause impulse on Joe’s part has brought him into obsessive or compulsive communication. And we find that he is so busy outflowing that he never has a chance to hear anyone who speaks to him and, if he did hear them, would not answer them. Bill, on the other hand, might be so very, very, very low on primal Cause (which is to say, low on communication origination) that he never even moves into Bill´ or, if he does, would never put forth his own opinion, thus unbalancing Joe further and further into further and further compulsive communication. As you can see by these Graphs, some novel situations could originate. There would be the matter of obsessive answering as well as inhibitive answering. An individual could spend all of his time answering, justifying or explaining—all the same thing—no primal communication having been originated at him. 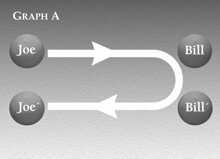 Another individual (as Joe´ in Graph A or Bill´ in Graph B) might spend all of his time acknowledging, even though nothing came his way to acknowledge. The common and most noticed manifestations, however, are “obsessive” and “compulsive origin” and “nonanswering acceptance” and “nonacknowledgment of answer.” And at these places we can discover stuck flows. As the only crime in the universe seems to be to communicate, and as the only saving grace of a person is to communicate, we can readily understand that an entanglement of communication is certain to result. What we should understand—and much more happily—is that it can now be resolved. 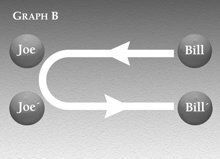 Thus it can be seen that there are only four parts which can become problematic (in both Graph A and Graph B), no matter the number of peculiar manifestations which can occur as a result thereof. a friendly inquiry about a person meaning, How are things? How are you getting on? prerecorded in a standardized form for general and repetitive use, thought of as patterned and unoriginal. For example, many weekly radio and television shows are recorded in advance for later broadcast, utilizing prerecorded laughter, clapping and other predictable, repetitive elements. being first, original. Primal impulses would be some form of communication originated first by someone or something else. changes or alters from one course of action or subject to another. a symbol written above and to the right of a name, letter, figure, etc., and used to distinguish it from another of the same kind. For example, Joe and Joe´ are the same name (and person) but the prime symbol represents Joe (prime) in different circumstances, conditions or actions. a quality or characteristic that makes up for other generally negative characteristics; redeeming feature.